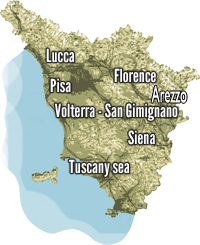 Franca’s farm is a few miles from a small village nestling in the heart of Valdicecina. The apartments are adjacent to the owners house who take care of first-person relationships with their customers. The whole family has been farming activity still boasting an estate of 70 hectares of land, some of which were devoted to the fine art of wine, whose production “home” refers to methods of the past. The apartments are spacious and well furnished, the furniture has been selected by the owners themselves after a careful restoration of furniture that even before they were inside the house. All apartments have a veranda or a private outdoor space with chairs and tables, available to all a large pool from which to enjoy a splendid view over the valley. The large lounge with direct access to the garden is used to make sale of their products as the oil, jams and great sauce, its porch is the place ideal for relaxing or reading a book relaxing. P1008-3/4: (mq 65) apartament TRILOCALE (4 persone +2) First floor Large kitchen / living room with satellite TV and sofa. Kitchen equipped with dishes, stove, oven and fridge, double bedroom, double bedroom, bathroom with shower.